You can fine-tune how QuickBooks 2019 works for you by setting QuickBooks preferences. If you indicate that you charge customers sales tax, for example, the EasyStep Interview describes how sales tax should work for your business by using the sales tax preferences. In fact, just so you know, much of what you do when you run QuickBooks Setup via the Detailed Start route (also known as the QuickBooks EasyStep Interview) is provide information that QuickBooks uses to fine-tune. 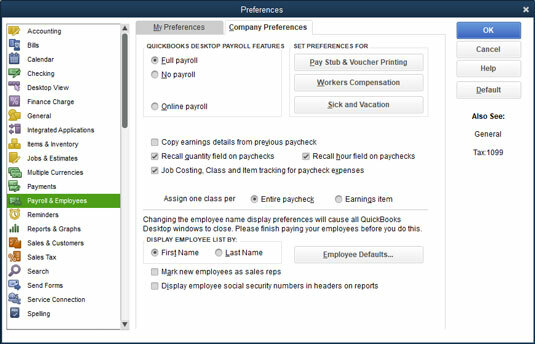 The Payroll & Employees Preferences set includes only the Company Preferences tab, shown. The QuickBooks Payroll Features radio buttons let you tell QuickBooks how you want to handle payroll: Full payroll (if you have signed up for Enhanced or Assisted Payroll), No payroll (if you use an outside service like Paychex/ADP or don’t process payroll), or Online payroll (if you’ve signed up for that service from Intuit). Note that QuickBooks displays only radio buttons that make sense given the version of QuickBooks you’ve selected. The Company Preferences tab of the Payroll & Employees Preferences dialog box. The Pay Stub & Voucher Printing button lets you tell QuickBooks what employee information to print on the payroll check: employee address, company address, sick-pay information, vacation-pay information, and pay-period information. You can figure out how this works by clicking the button and looking at the dialog box that QuickBooks displays. The Workers Compensation button lets you fiddle with the way that QuickBooks tracks information related to your workers’ compensation tax. The Sick and Vacation button lets you fine-tune how QuickBooks monitors employee sick- and vacation-pay accrual and use. Again, click either of these buttons to see a screen that provides more information about how the button works. Copy Earnings Details from Previous Paycheck: Another duh. Recall Hour Field on Paychecks: QuickBooks recalls or reuses hours-worked information from the last pay period’s paychecks. You use this option when you have a fixed number of hours that occurs from paycheck to paycheck. Job Costing, Class, and Item Tracking for Paycheck Expenses: QuickBooks lets you track payroll expenses not just by account, but also by job, class, or item. The Display Employee List By radio buttons let you choose how employee lists are sorted on reports: by first name or by last name. If you click the Employee Defaults button, QuickBooks displays a dialog box that you can use to set employee payroll default information, such as deductions for taxes or health insurance. Finally, at the bottom of the dialog box, QuickBooks provides two other options for handling payroll. The Mark New Employees As Sales Reps check box, if selected, does what you’d expect: It marks new employees that you add to the Employee list as sales reps. And the check box titled Display Employee Social Security Numbers in Headers on Reports, if selected, also does what you’d expect: It adds employee Social Security numbers to reports. Although no personal QuickBooks preferences are available for sales tax, company preferences do exist. 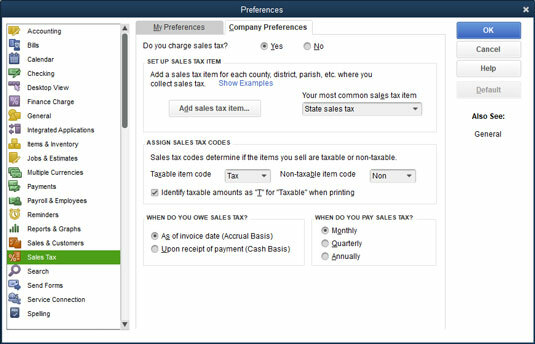 The figure shows the Company Preferences tab of the Sales Tax Preferences dialog box. The Do You Charge Sales Tax? radio buttons, which appear at the top of the tab, control whether you can charge sales tax within QuickBooks. You select the radio button — Yes or No — that answers the question. The Company Preferences tab of the Sales Tax Preferences dialog box. The Taxable Item Code and Non-Taxable Item Code drop-down lists let you define what code QuickBooks should use to identify taxable and nontaxable sales. By default, QuickBooks uses the clever “tax” code for taxable sales and the equally clever “non” code for nontaxable sales. You can choose the Add New entry from either drop-down list, however, and use the dialog box that QuickBooks displays to create your own taxable and nontaxable codes. The Set Up Sales Tax Item and Assign Sales Tax Codes sections let you set up an item for the sales tax that you charge on invoices. You can indicate the default (or most common) sales tax item that you want to include by entering this sales tax item name in the Your Most Common Sales Tax Item combo box. To add the sales tax item, choose Add New from this drop-down list and complete the dialog box that QuickBooks displays. The New Item dialog box lets you name the sales tax item and identify the sales tax rate. The Taxable Item Code and Non-Taxable Item Code drop-down lists let you select the code words to designate invoice items as subject to sales tax. The check box titled Identify Taxable Amounts as “T” for “Taxable” When Printing, if selected, tells QuickBooks to flag taxable amounts on an invoice with the code T.
The When Do You Owe Sales Tax? radio buttons let you indicate when the taxing authority says you owe sales tax: as of the invoice date (which means that the taxing authority requires accrual-basis accounting) or upon receipt of payment (which means that the taxing authority allows cash-basis accounting). No personal preferences exist for 1099 tax reporting. Company preferences exist, however, as indicated by the Company Preferences tab, shown. This tab lets you tell QuickBooks when you’re required to file 1099-MISC forms (answer the Do You File 1099-MISC Forms? question by selecting the Yes radio button). The tab also lets you map QuickBooks accounts to the different boxes on the 1099 form you use to report payments to independent contractors. (To do this, click the Click Here hyperlink.) Confer with your tax adviser if you have questions about these boxes or the 1099 reporting threshold amounts, or visit the IRS website. 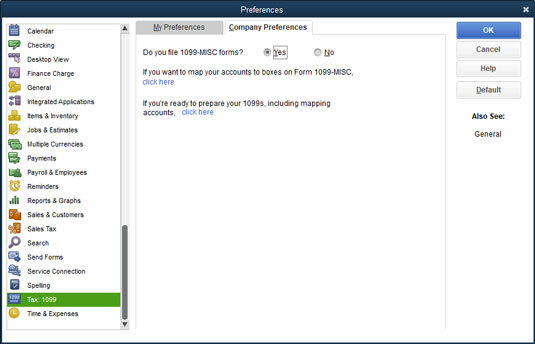 The Company Preferences tab of the Tax: 1099 Preferences dialog box. If you display the Preferences dialog box and click the Checking icon, QuickBooks displays either the My Preferences tab or the Company Preferences tab. The My Preferences tab of the Checking Preferences dialog box. The Company Preferences tab of the Checking Preferences dialog box. 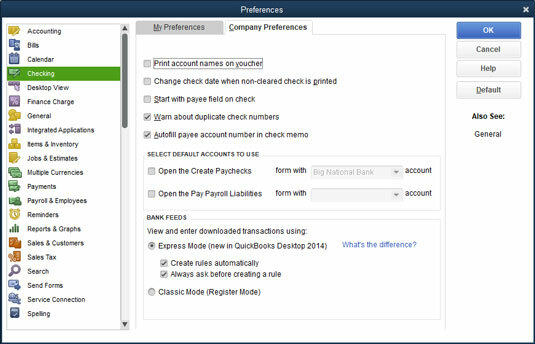 The My Preferences tab of the Checking Preferences dialog box lets you tell QuickBooks which account it should suggest as a default account when you open particular types of windows within QuickBooks. If you look closely at the My Preferences tab, you see the Open the Write Checks box, which is the first check box on the tab. To the right of the Open the Write Checks box, you see the Form with X Account drop-down list. If you select the Open the Write Checks check box, you can choose an account from the Form with X Account drop-down list. This setting tells QuickBooks to use or suggest the specified account every time you open the Write Checks window. The My Preferences tab also includes check boxes that you can use to specify the default account for the Pay Bills window, the Pay Sales Tax window, and the Make Deposits window. If you have multiple checking accounts set up, setting the default accounts by using the My Preferences tab is a good idea. Setting these preferences makes it less likely that you’ll erroneously write checks on or pay bills from the wrong account. Print Account Names on Voucher: This check box lets you indicate to QuickBooks that it should print account names on the voucher portion of the check. Change Check Date When Non-Cleared Check Is Printed: Select this check box to tell QuickBooks to use the current system date as the printed check date. Start with Payee Field on Check: Select this check box to tell QuickBooks to place the insertion point, or text cursor, in the Payee field when you open the Write Checks window. Autofill Payee Account Number in Check Memo: Select this check box to tell QuickBooks to automatically fill in the payee account number when you write a check. QuickBooks retrieves the account number for a payee from the Vendor list or from the Other Names list. Select Default Accounts to Use: These check boxes let you specify which account QuickBooks suggests when you open the Create Paychecks window or open the Pay Payroll Liabilities window. Essentially, then, these boxes let you tell QuickBooks which checking account you use to write payroll checks and to pay payroll liabilities, such as federal income tax withholding amounts. 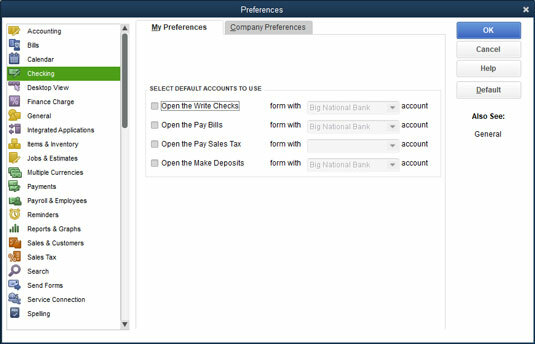 Bank Feeds: If you’ve turned on online banking for QuickBooks, QuickBooks provides option buttons you can use to change the way that online transaction information appears in the online banking window.